I’ve been on medication for anxiety and depression for two years. It’s a day too late to talk about it on World Mental Health Day, but I figured, hey, why not. In that two years, I’ve been fighting for balance — balance between my brain chemistry and what I’m introducing to it in order to make it easier on myself. Despite those hesitations, at the time I was really just looking for a break. I was truly starting to recognize how out of control my anxiety was, and it was starting to bleed into all facets of my life. I made an appointment, I tried a sample, and… I just did it. The change wasn’t instant. It took time for my brain to get used to the new routine, and it was hard to differentiate whether things were actually changing. It’s hard, because if you’re having a good period, you almost don’t know whether to attribute it to something the meds are doing. Even now, I’m wondering how much of my recent happiness and stability is “me,” and whether I’d lose it if I decided to stop. 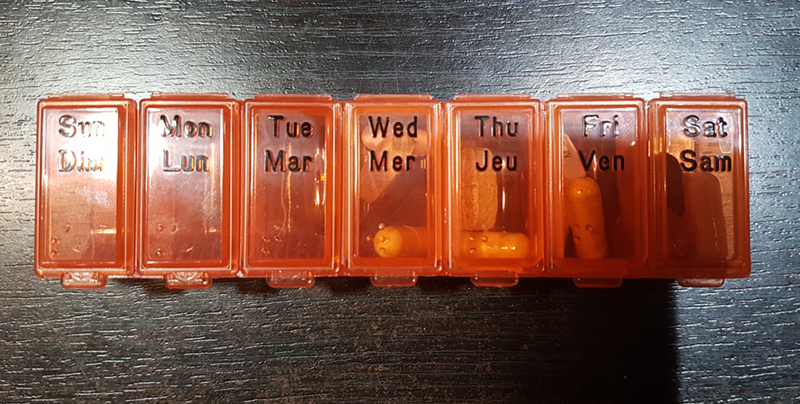 In two years, I don’t think I’ve missed so many days with my meds that I’ve felt the kind of slip that would worry me. It’s just been fully absorbed into my routine at this point, and I don’t even really feel like it’s that weird anymore. Along with regular therapy, I’ve been able to find a good balance — I have the ability to stay stable, with multiple checks and balances to help me when I feel off. Basically, what I was told (and what I find) is that medication for this kind of thing isn’t usually severe enough to tug your brain in a specific direction you’re able to feel. In my doctor’s words, it isn’t going to “cure” me, only put me “on a level playing field” to be able to deal with situations in a more consistent way. I’m hesitant to say that there’s nothing to “cure;” some days, it feels like I’m definitely in the middle of something that, when taken away, would improve my life. To be honest, I think I’m happy that it isn’t drastic, because it’s given me confidence to know that when things get easier, or more consistent, it’s because I’ve put in that work. I made the progress and put in the time to learn to trust myself and my feelings, and the medication just made sure that I had a somewhat stable foundation. The more I think and talk about mental health, the more that foundation metaphor comes up; it’s truly essential and almost underrated. I cannot stress enough how much you owe it to yourself to shut down an out-of-control situation and put yourself in a position to change it. Nothing should get in your way to doing so, if you’re truly serious about getting better. I can’t advise someone as to whether they should get medication or not because I’m not a professional, and I don’t believe in advising massive changes for someone else to undertake. However, I believe that if you trust your doctor enough to have an honest conversation with them, you shouldn’t be afraid to bring it up. Despite whatever stigma lays there — despite what you think other people might think or say — you need to be able to start that first leg of the journey under the right circumstances. You have the right to switch if something doesn’t feel right. You have the right to seek something that works. When you’re in the depths of an anxiety spiral, I think that’s the thing that hits hardest: not seeing that solution. For me, it just took a slowing down to help me see that things didn’t have to be solved right then, and a slow change could be the one that succeeds in the end. While the horror stories imply a lack of control and lack of self, I feel my experience has been positive due to communication, trust, and a lot of fine tuning fueled by developing patience for myself. And if you’re having trouble, I sincerely hope you find your road to getting better.